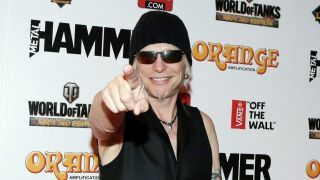 Michael Schenker says the deaths of some of his musical heroes made him want to work in a band environment again. The guitar icon releases his third album with his Temple Of Rock project on March 23. Entitled Spirit On A Mission, the record features bassist Francis Buchholz, drummer Herman Rarebell, frontman Doogie White and keyboardist/guitarist Wayne Findlay. The recording sessions for Spirit On A Mission were thrown into disarray last year when computers containing much of the recorded material were stolen from a studio in Germany. Earlier this month, Michael Schenker’s Temple Of Rock released a video for new track Live & Let Live.